In this section, you will have a description on how to use the Help Window. Shows a list of main topics in Help Window. You can click the list to view a topic and and double click to view a sub-topic. Click the buttoms in the left top corner to retrace your steps in Help Window. Click the Hide button to hide the sidebar in the left of the Help Window. Click the Show button to show the hidden sidebar after pressing Hide button. Click the Back button to back to the previous topics you have visited. Click the Prink button to print the selected topic or selected heading and all sub topics. The following search tips may hep you to search topics in an effective way. 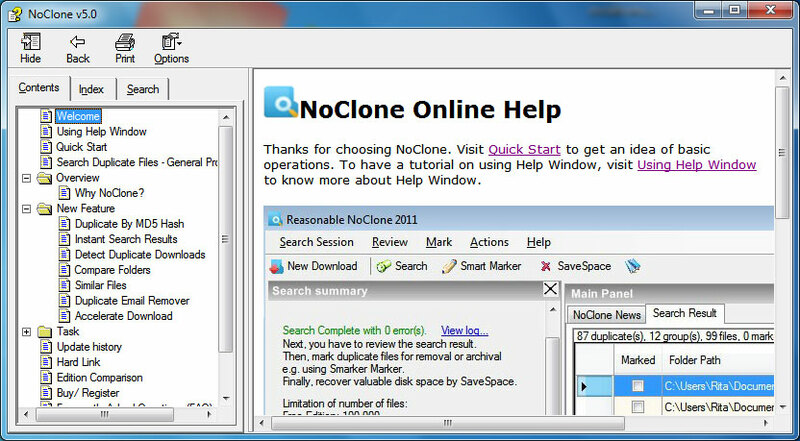 As it is not an internet search machine, you may not find topics that are not related to Noclone. The search machine only search all the words you type in without checking gramma. Therefore instead of searching with keyword "Duplicates with criteria", "Duplicate criteria" is enough for the search machine to perform searching. But please make sure that the keywords correctly.